There’s nothing typical about Quinn Fairfield. The outspoken suffragette spends her days writing sensational headlines as a newspaper reporter and indulging her natural curiosity. She’s much more likely to be found riding a bicycle around town than learning the social graces at which her sister, Caitlyn, excels. When Caitlyn announces her plans to wed a man Quinn doesn’t trust, she sets out to find a reason to break up the happy couple. In the process, she finds herself falling for an intriguing, kind-hearted man. After spending several years in Portland at college, Walker Williams returns to Pendleton, eager to make his mark on the world. He’s determined to become a legendary architect despite the challenges that arise from his upbringing on the nearby Umatilla Reservation. When a feisty red-headed newspaper reporter catches his eye and captures his heart, Walker fights his growing feelings for her. He’ll do anything to shelter Quinn from the prejudices aimed at him and his heritage. Can the two of them overcome their fears, set aside the burdens of the past, and surrender to the sweet romance blossoming between them? 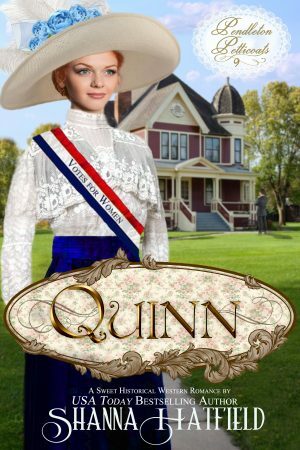 Filled with laughter, adventure, and historical tidbits from 1912, Quinn is a sweet historical romance brimming with hope and love. Quinn stuffed her sore toes into her shoes and rose from the table. She’d only taken two steps when a tall, muscular man stepped in front of her and offered her a teasing smile. “If I’m not mistaken, Miss Fairfield, this dance is mine,” he said in a voice that resonated through her head and plucked at something in her heart. Quinn’s gaze traveled from the toes of expertly polished boots up the long legs of expensive black pants, over a solid chest and broad shoulders, to a face that was every bit as attractive as Drake Dillinger’s. Walker Williams’ wide face, bronzed skin, high cheekbones, and dark eyes bore testament to his native heritage. But his cropped black hair and eloquent speech belied his upbringing on the nearby Umatilla Indian Reservation. The effort he put into looking like a successful businessman, with impeccable manners and finely-tailored suits, was notable. Regardless, she sensed a turbulent ruggedness lurking beneath the surface that no amount of civilization could tame or hide. At that moment, as he smiled at her with a spark of amusement and interest flickering in his eyes, she could practically feel the wildness of his spirit surrounding her as Walker took a step closer. She inhaled his masculine, entrancing scent as he moved another step nearer. Merciful heavens! He smelled as divinely wonderful as he looked. Her senses dove into a whirl of unexpected invigoration when he offered her a slightly crooked grin. “If your feet have recovered from Mr. Silvers’ abuse, would you do me the honor of this dance, Miss Fairfield?” Walker held out a hand toward her.